Received January 1, 2018; Accepted August 27, 2018.; Published online January 2, 2019. Chronic neuropathic pain is one of the primary causes of disability subsequent to spinal cord injury. Patients experiencing neuropathic pain after spinal cord injury suffer from poor quality of life, so complementary therapy is seriously needed. Dehydrocorybulbine is an alkaloid extracted from Corydalis yanhusuo. It effectively alleviates neuropathic pain. In the present study, we explored the effect of dehydrocorybulbine on neuropathic pain after spinal cord injury and delineated its possible mechanism. Experiments were performed in rats to evaluate the contribution of dehydrocorybulbine to P2X4 signaling in the modulation of pain-related behaviors and the levels of pronociceptive interleukins and proteins after spinal cord injury. In a rat contusion injury model, we confirmed that chronic neuropathic pain is present on day 7 after spinal cord injury and P2X4R expression is exacerbated after spinal cord injury. We also found that administration of dehydrocorybulbine by tail vein injection relieved pain behaviors in rat contusion injury models without affecting motor functions. The elevation in the levels of pronociceptive interleukins (IL-1β, IL-18, MMP-9) after spinal cord injury was mitigated by dehydrocorybulbine. 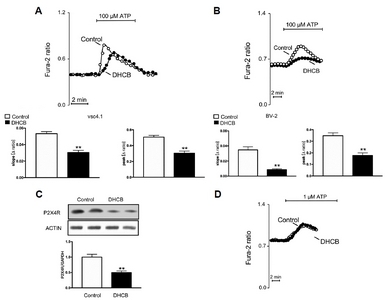 Dehydrocorybulbine significantly mitigated the upregulation of P2X4 receptor and reduced ATP-evoked intracellular Ca2+ concentration. Both P2XR and dopamine receptor2 agonists antagonized dehydrocorybulbine’s antinociceptive effects. In conclusion, we propose that dehydrocorybulbine produces antinociceptive effects in spinal cord injury models by inhibiting P2X4R. Chronic neuropathic pain is one of the major causes of disability after spinal cord injury (SCI), and it is difficult to treat (van Gorp et al., 2015). Patients experiencing neuropathic pain post-SCI suffer from poor quality of life (Beattie et al., 2002). Neuropathic pain (NP), considered the most severe type of pain to occur post-SCI, is caused by nervous system damage and dysfunction (Lefèvre et al., 2015). It is refractory to treatment. Due to various side effects of current analgesic drugs, there is an intense and ongoing search for new therapeutic alternatives. Corydalis yanhusuo. W.T. Wang (YHS), officially listed in the Chinese Pharmacopoeia, has been widely used for treatment of pain and inflammation (Cao et al., 2011; Chu et al., 2008; Kang et al., 2016; Lee et al., 2001; Wang et al., 2016; Yuan et al., 2004; Zhang et al., 2015; Zhou et al., 2016). l-tetrahydropalmatine (l-THP) and dehydrocorybulbine (DHCB) have been isolated and quantified in YHS. 1-THP is considered the cause of most of the analgesic properties of YHS, and therefore the mechanisms underlying these effects have been extensively elucidated. However, recent studies have found that DHCB is also responsible for the analgesic effects of YHS. DHCB acts against inflammatory pain and injury-induced neuropathic pain by modulating dopamine receptors and causes no antinociceptive tolerance (Zhang et al., 2014). The purinergic P2 receptors, of which seven P2X and eight P2Y subtypes (P2X1R-P2X7R, P2Y1R, P2Y2R, P2Y4R P2Y6R, P2Y11-14R) have been identified, are a diverse family of proteins activated by extracellular ATP and involved in neuroinflammation and neuropathic pain (Burnstock, 2006; Tsuda et al., 2003; Ulmann et al., 2008). P2X4 receptors are ligand-gated cation channels and have been reported to contribute to neuropathic pain (Tsuda et al., 2003). We assumed that DHCB might exert its antinociceptive properties by intervening with P2X4 receptors. Despite the many studies on YHS antinociceptive role, the exact mechanism by which DHCB functions in neuropathic pain remains to be elucidated. First, we confirmed the effects of spinal cord injury upon P2X4R level and pronociceptive interleukins. Then we evaluated the antinociceptive effect of DHCB on neuropathic pain after SCI and explored the related molecular mechanism. Sprague-Dawley rats were purchased from the Animal Center of the Chinese Academy of Sciences of Shanghai, China. Procedures with experimental animals were approved by the Animal Care and Use Committee of Henan University of Chinese Medicine. Adult male Sprague-Dawley rats (8–10 weeks of age) weighing approximately 255 g were anesthetized. Along the midline of the dorsum to expose the vertebral column, transection of the spinal cord at T4 level was performed in SCI models (n = 21). Sham group rats underwent the same surgical procedure but not transected (n = 7). After surgery, the 21 SCI rats were randomly divided into three groups: SCI group (n = 7), DHCB (2 nM)-treated group (n = 7), DHCB (20 nM)-treated group (n = 7). To evaluated the effects of Quinpirole hydrochloride and ATP, 21 SCI rats were randomly divided into three groups and administered corresponding components according to experimental design. DHCB (Toronto Research Chemicals, Canada) (5 mg/Kg/day) or Quinpirole hydrochloride (1 mg/Kg/day) (Sigma, USA) or ATP (2 mg/Kg/day) was injected by tail vein every three days. Equivalent normal saline injections were treated as vehicle control. VSC4.1 motoneurons were formed by fusion of dissociated embryonic rat ventral spinal cord neuron with mouse N18TG2 neuroblastoma cells (Smith et al., 1994). VSC4.1 cells were maintained on culture dishes coated with poly-l-ornithine (PLO) (Sigma) in DMEM:F12 (1:1) containing Glutamax supplemented with 2% FBS, 1% N1 (Sigma) and 1% NEAA (referred to as VSC4.1 complete medium). The immortalized murine BV-2 microglial cell line was purchased from the Shanghai Institute of Cell Biology. The BV-2 cells were cultured in EMEM (Invitrogen, USA) supplemented with 10% FBS, 100 units/ml penicillin and 100 μg/ml streptomycin. Cells were treated with Quinpirole hydrochloride (10 μM) or DHCB (2 nM) for 12 h.
Mechanical hypersensitivity was measured by using von Frey filament (2.0 g, North Coast Medical, USA) as described previously. Paw withdrawal response frequency (PWF) was taken to determine nociceptive responses to innocuous mechanical stimuli. A von Frey filament was applied to plantar surface of hind paw. The filament was applied 10 times to each paw, with 10 s of time interval. The number of paw withdrawal responses after each filament stimulus was then counted. Spinal cord tissue samples were collected after the scarification of rats. The spinal cord segments at the contusion epicenter and lumbar spinal cord were dissected and frozen at −80°C (Zhang et al., 2017). Tissues were lysed in RIPA buffer (Beyotime, China) with 1% phenylmethylsulfonyl fluoride (Beyotime) and 1% protein phosphatase inhibitor (Beyotime) on ice for 30 min. The samples were centrifuged at 14,000 rpm and 4°C for 20 min. The supernatant was removed and used for Western blotting. Total protein (40–60 μg) was load onto SDS-PAGE, and then transferred to PVDF membranes and blocked in 5% non-fat milk/Tris-buffered saline/Tween-20 (TBST) at room temperature for 2 h. Membranes were probed overnight at 4°C with P2X4R, IL-1β (1:1000, Abcam), IL-18 (1:1000, Abcam), MMP-9 (1:1000, Invitrogen) antibodies. After incubation with horseradish peroxidase-conjugated anti-rabbit secondary antibody (1:2000, Sigma) for 1 h at room temperature, the bands were visualized with enhanced chemiluminescence reagents (Sigma). Densitometric quantification of the membranes was performed using Image J.
Intracellular Ca2+ was measured following addition of MgATP in the presence of thapsigargin (1 μmol/l, Sigma) (Yan et al., 2018). Fluorescence measurements were carried out with an inverted phase-contrast microscope (Axiovert 100, Germany). The cells were loaded with Fura-2/AM (2 μM, Biodee, China) for 30 min at 37°C. Cells were excited alternatively at 340 or 380 nm and the light was deflected by a dichroic mirror into either the objective (Fluar 40×/1.30 oil, Germany) or a camera. Emitted fluorescence intensity was recorded at 505 nm and data acquisition was accomplished by using specialized computer software (Metafluor, USA). The corresponding ratios (F340/F380) were used to obtain intracellular Ca2+ concentrations. The following equation was used: [Ca2+]free = Kd x ((R-Rmin)/(Rmax-R)) x Sf (Kd – dissociation constant of Fura-2; R – ratio of emission intensity, exciting at 340 nm, to emission intensity, exciting at 380 nm; Rmin – ratio at zero free Ca2+; Rmax – ratio at saturating Ca2+; Sf – instrumental constant). As a measure for the increase of cytosolic Ca2+ activity, the slope and peak of the changes in the intracellular Ca2+ concentration were calculated for each experiment. Data are provided as means ± SEM, n represents the number of individual experiments. All data were analysed by unpaired Student t-test or ANOVA followed by post hoc Bonferroni test. Between-group differences in BBB scores and inclined plane test results were analysed using generalized linear mixed models. Only results with P < 0.05 were considered statistically significant. Spinal cord injury (SCI) results in a loss of neurons and consequent motor and sensory impairment. Herein, we aimed to study the effects of DHCB on SCI-induced neuropathic pain and explore the related mechanism. Widely used animal models of SCI include transection or experimental contusion and compression. Complete transection animal model of SCI causes severe behavioral (locomotor) and histological (axonal damage) changes (Lukovic et al., 2015). These are useful to study the effects of neurotrophic factors in SCI (Sharif et al., 2017). To confirm the influence of spinal cord injury on P2X4R levels and pronociceptive interleukins in the spinal cord, we established a spinal transection model. As illustrated in Fig. 1A, upregulation of P2X4R levels in the spinal cords of rats after SCI was confirmed. Furthermore, the levels of expression of IL-1β, IL-18, and MMP-9 in SCI group were higher than in the sham group. To evaluate the antinociceptive role of DHCB in neuropathic pain after SCI, we examined the effect of DHCB on SCI-induced mechanical allodynia (MA) in rats. DHCB was administrated by tail vein injection every three days after SCI. Spinal cord injury caused pain-related behavior and DHCB significantly alleviated SCI-induced MA in a dose-dependent manner (Fig. 1B). Given the similar effects of both low and high doses of DHCB, we chose a low concentration (2 nmol) to perform following experiments. We further examined the therapeutic role of DHCB in locomotor recovery after SCI through BBB scores and inclined plane test. DHCB significantly rescued the BBB scores of SCI group until 10 days later (Fig. 1C). Likewise, the inclined plane test scores showed the same trend (Fig. 1C). Furthermore, the increase in protein levels of IL-1β, IL-18, and MMP-9 after SCI was significantly abolished by DHCB (2 nmol) (Fig. 1A). Given the importance of P2X4R in pain, the effects of DHCB on P2X4R were assessed. Injection of DHCB markedly reduced SCI-induced P2X4 expression in the spinal cord (Fig. 1A). To confirm these in-vivo findings of DHCB, we used VSC4.1 cells to ascertain whether or not DHCB influences P2X receptors at the cellular level. Taking advantage of the high Ca2+ permeability of P2X4 channels, we utilized Fura-2 fluorescence measurements of the rise of intracellular Ca2+ concentration evoked by high concentration of ATP (100 μM). Results showed that DHCB downregulated the expression of P2X4R in VSC4.1 cells (Fig. 2C). Calcium imaging results also showed that (100 μM) ATP-evoked intracellular Ca2+ entry was significantly reduced after DHCB treatment lasting 12 h (Figs. 2A and 2B) both in VSC4.1 and BV-2 cells. Specifically, (1 μM) ATP-evoked intracellular Ca2+ entry representing P2X7R function was not affected by DHCB treatment (Fig. 2D), which further indicates the involvement of P2X4R in DHCB function. To determine the exact pathway by which DHCB exerts its role, we examined the effect of Quinpirole on P2X4 signaling. As shown in Fig. 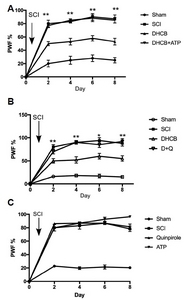 3, Dopamine receptor2 agonist Quinpirole (10 μM) increased P2X4R expression in VSC4.1 cells (Fig. 3A). To determine the involvement of dopamine D2 receptor, we administered Quinpirole (10 μM) in DHCB-treated VSC4.1 cells (Figs. 3B and 3C). 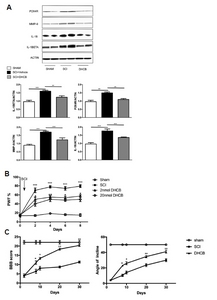 The inhibitory effect of DHCB on ATP-induced calcium influx was attenuated by Quinpirole. 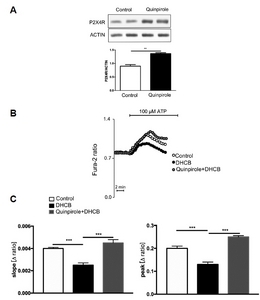 Additionally, both Quinpirole and ATP antagonized the DHCB antinociceptive response (Figs. 4A and 4B), confirming that DHCB functions by affecting the P2XR and D2 receptor (D2R) (Zhang et al., 2014). Neither Quinpirole (1 mg/kg) nor ATP (1 mg/kg) showed any analgesic effect after spinal cord injury (Fig. 4C). YHS has been widely used clinically for the treatment of pain and inflammation in China. l-tetrahydropalmatine (l-THP) and dehydrocorybulbine (DHCB) are considered as two major alkaloids isolated from YHS. 1-THP causes most of the analgesic properties of YHS, so the underlying mechanisms have been extensively elucidated. However, recent studies have found that DHCB is more analgesic than l-THP at a nonsedative dose and is less sedative (Zhang et al., 2014), offering longer-term relief than opiate drugs (Pain, 2016; Zhang et al., 2014). Our studies provide evidence that administration of DHCB significantly relieved pain behaviors in SCI models without affecting motor functions. In general, mechanical allodynia (MA) in the hindpaw is associated with low-level pain after SCI. We demonstrated that DHCB significantly alleviated SCI-induced MA in a dose-dependent manner and facilitated motor recovery. P2X4s belong to ligand-gated cation channels and contribute to neuropathic pain (Jurga et al., 2017; Tsuda et al., 2003). The present study showed that DHCB downregulated SCI-evoked P2X4R expression both in contusion epicenter and lumbar spinal cord, suggesting that DHCB may exert its analgesic role by inhibiting P2X4R. DHCB significantly blunted ATP (100 μM)-evoked Ca2+ influx but had no effect on ATP (1 μM)-evoked Ca2+ influx in VSC4.1 cells. P2X4 channels are activated by high concentrations of ATP (100 μM), while P2X7 by a relatively low concentration of ATP (1 μM). All these findings indicate that DHCB plays a regulatory role in P2X4 signaling but P2X7 does not. Given that microglia participate in the inflammatory response after spinal cord injury (David and Kroner, 2011), BV-2 microglial cell line was also utilized to confirm the effects of DHCB. As expected, DHCB also inhibited P2X4R function in BV-2 cells. Moreover, 2 h of DHCB failed to modulate P2X channels, indicating an indirect relationship between DHCB and P2X4R. Lines of evidence suggests that DHCB exerts its antinociceptive responses by binding to dopamine D2 receptor (D2R) directly (Hagelberg et al., 2002; Ma et al., 2008; Zhang et al., 2014). Notably, Rubini (2007) reported that blockage of dopamine receptors results in a failure of dopamine to modulate intracellular Ca2+ concentration responses to ATP (Rubini et al., 2008), indicating the involvement of dopamine pathway in purinergic signaling. To further elucidate the relationship between P2X4R and D2R, we checked the effect of the D2R agonist-Quinpirole on P2X4R function. Results showed that Quinpirole enhanced the expression of P2X4R and ATP (100 μM)-evoked Ca2+ influx in VSC4.1 cells, suggesting that D2R activation facilitates P2X4 channel. Consistent with the findings given above, both agonists of P2X4 and D2R abolished the antinociceptive effects of DHCB. Taken together, we proposed that DHCB may regulate P2X4R functions through D2R. D2R may exert both inhibitory and facilitatory influences on nociceptive and analgesic mechanisms (Ben-Sreti et al., 1983; Cobacho et al., 2014; Roane and Paul, 1992). Some previously published studies suggested that intraperitoneal injection of Quinpirole inhibits cold- and tactile-allodynia (Almeida-Santos et al., 2015; Cobacho et al., 2014). However, the present study showed that i.v. Quinpirole had no antinociception, which indicates that the analgesic effect of Quinpirole is dependent on the action sites. Another possible reason might be the dose-dependent analgesic effect of Quinpirole (Pelissier et al., 2006). Our results showed that 1 mg/kg quinpirole did not affect nociception, whereas it significantly abolished DHCB function, indicating that the function of DHCB is D2 receptor sensitive. DHCB, acting as a D2R antagonist, produced antinociceptive effect by i.v. Elevated levels of pronociceptive factors including IL-1β, IL-18, and MMP-9 in SCI models could be modulated by DHCB, suggesting a privileged role of DHCB in pain. Purinergic signaling is involved in the release of pronociceptive factors (Ferrari et al., 1997; He et al., 2017). P2X4 knock-out mice showed impaired inflammasome signaling in the cord, resulting in decreased levels of IL-1β and IL-18 (De et al., 2012; Sakaki et al., 2013). Therefore, our findings indicate that DHCB-induced decreases in cytokine levels, including decreases in IL-1β, IL-18, and MMP-9, may be explained by its inhibitory effect on P2X4R. In conclusion, we find that DHCB might regulate P2X4R function, so exerting its analgesic effect. Fig. 1. (A) Original Western blot and arithmetic means ± SEM (n = 6) showing IL-1β, IL-18, MMP-9 and P2X4R expression in the spinal cord following SCI after iv DHCB. (B) Arithmetic means ± SEM (n = 7) showing paw withdrawal response frequency of SCI group mice treated with DHCB. ***P < 0.001 indicates significant difference from Sham group. #p < 0.05, ##P <0.01 indicates significant difference from SCI group. (C) Graphs of the BBB score and the inclined plane test (n = 7). *P < 0.05, **P < 0.01, indicates significant difference from SCI group. Fig. 2. (A) Representative tracings of Fura-2 fluorescence-ratio in fluorescence spectrometry before and following application of 100 μM ATP in VSC4.1 cells with DHCB administration (2 nM, 12 h). Arithmetic means ± SEM (n = 5) of slope and peak increase of fura-2-fluorescence-ratio following addition of ATP. (B) Representative tracings of Fura-2 fluorescence-ratio in fluorescence spectrometry before and following application of 100 μM ATP in BV-2 cells with DHCB administration for 12h. Arithmetic means ± SEM (n = 5) of slope and peak increase of fura-2-fluorescence-ratio following addition of ATP. (C) Original Western blot showing P2X4R level in VSC4.1 cells with DHCB treatment (2 nM, 12 h). Arithmetic means ± SEM (n = 5) showing P2X4R level in VSC4.1 cells with DHCB treatment (2 nM, 12 h). (D) Representative tracings of Fura-2 fluorescence-ratio in fluorescence spectrometry before and following application of 1 μM ATP with DHCB administration for 12 h. **P < 0.01, indicates significant difference. Fig. 3. (A) Original Western blot showing P2X4R after Quinpirole treatment in VSC4.1 cells (10 μM, 12 h). Arithmetic means ± SEM (n = 5) showing P2X4R after Quinpirole treatment in VSC4.1 cells (10 μM, 12 h). (B) Representative tracings of Fura-2 fluorescence-ratio in fluorescence spectrometry before and following application of 100 μM ATP in VSC4.1 cells with quinpirole (10 μM) administration in the presence of DHCB (2 nM, 12 h). (C) Arithmetic means ± SEM (n = 5) of slope and peak increase of fura-2-fluorescence-ratio following addition of ATP (100 μM) in the presence of quinpirole (10 μM) in DHCB-treated VSC4.1 cells. **P < 0.01, ***P < 0.001 indicates significant difference. Fig. 4. (A) Arithmetic means ± SEM (n = 7) showing paw withdrawal response frequency of SCI-group mice treated with ATP in the combination of DHCB. (B) Arithmetic means ± SEM (n = 7) showing paw withdrawal response frequency of SCI-group mice treated with Quinpirole in the combination of DHCB. (C) Arithmetic means ± SEM (n = 7) showing paw withdrawal response frequency of SCI-group mice treated with Quinpirole (10 μM) or ATP. *P < 0.05), **P < 0.01 indicate statistically significant difference. Almeida-Santos, A.F., Ferreira, R.C.M., Duarte, I.D., Aguiar, D.C., Romero, T.R.L., and Moreira, F.A. (2015). The antipsychotic aripiprazole induces antinociceptive effects: Possible role of peripheral dopamine D2 and serotonin 5-HT1A receptors. Eur J Pharmacol. 765, 300-306. Burnstock, G. (2006). Purinergic P2 receptors as targets for novel analgesics. Pharmacol Ther. 110, 433-454. Cao, F.L., Shang, G.W., Wang, Y., Yang, F., Li, C.L., and Chen, J. (2011). Antinociceptive effects of intragastric DL-tetrahydropalmatine on visceral and somatic persistent nociception and pain hypersensitivity in rats. Pharmacol Biochem Behav. 100, 199-204. Chu, H., Jin, G., Friedman, E., and Zhen, X. (2008). Recent development in studies of tetrahydroprotoberberines: mechanism in antinociception and drug addiction. Cell Mol Neurobiol. 28, 491-499. Cobacho, N., la Calle de, J.L., and Paíno, C.L. (2014). Dopaminergic modulation of neuropathic pain: analgesia in rats by a D2-type receptor agonist. Brain Res Bull. 106, 62-71. David, S., and Kroner, A. (2011). Repertoire of microglial and macrophage responses after spinal cord injury. Nat Rev Neurosci. 12, 388-399. Ferrari, D., Chiozzi, P., Falzoni, S., Hanau, S., and Di Virgilio, F. (1997). Purinergic modulation of interleukin-1 beta release from microglial cells stimulated with bacterial endotoxin. J Exp Med. 185, 579-582. Hagelberg, N., Martikainen, I.K., Mansikka, H., Hinkka, S., Någren, K., Hietala, J., Scheinin, H., and Pertovaara, A. (2002). Dopamine D2 receptor binding in the human brain is associated with the response to painful stimulation and pain modulatory capacity. Pain. 99, 273-279. He, Y., Taylor, N., Fourgeaud, L., and Bhattacharya, A. (2017). The role of microglial P2X7: modulation of cell death and cytokine release. J Neuroinflammation. 14, 135. Jurga, A.M., Piotrowska, A., Makuch, W., Przewlocka, B., and Mika, J. (2017). Blockade of P2X4 Receptors Inhibits Neuropathic Pain-Related Behavior by Preventing MMP-9 Activation and, Consequently, Pronociceptive Interleukin Release in a Rat Model. Front Pharmacol. 8, 48. Kang, D.W., Moon, J.Y., Choi, J.G., Kang, S.Y., Ryu, Y., Park, J.B., Lee, J.H., and Kim, H.W. (2016). Antinociceptive profile of levotetrahydropalmatine in acute and chronic pain mice models: role of spinal sigma-1 receptor. Sci Rep. 6, 37850. Lee, Y.L., Sagare, A.P., Lee, C.Y., Feng, H.T., Ko, Y.C., Shaw, J.F., and Tsay, H.S. (2001). Formation of protoberberine-type alkaloids by the tubers of somatic embryo-derived plants of Corydalis yanhusuo. Planta Med. 67, 839-842. Lefèvre, Y., Amadio, A., Vincent, P., Descheemaeker, A., Oliet, S.H.R., Dallel, R., and Voisin, D.L. (2015). Neuropathic pain depends upon D-serine co-activation of spinal NMDA receptors in rats. Neurosci Lett. 603, 42-47. Ma, Z.Z., Xu, W., Jensen, N.H., Roth, B.L., Liu-Chen, L.Y., and Lee, D.Y.W. (2008). Isoquinoline alkaloids isolated from Corydalis yanhusuo and their binding affinities at the dopamine D1 receptor. Molecules. 13, 2303-2312. Pain, S. (2016). Painful progress. Nature. 535, S18-S19. Rubini, P., Engelhardt, J., Wirkner, K., and Illes, P. (2008). Modulation by D1 and D2 dopamine receptors of ATP-induced release of intracellular Ca2+ in cultured rat striatal neurons. Neurochem Int. 52, 113-118. Tsuda, M., Shigemoto-Mogami, Y., Koizumi, S., Mizokoshi, A., Kohsaka, S., Salter, M.W., and Inoue, K. (2003). P2X4 receptors induced in spinal microglia gate tactile allodynia after nerve injury. Nature. 424, 778-783. Ulmann, L., Hatcher, J.P., Hughes, J.P., Chaumont, S., Green, P.J., Conquet, F., Buell, G.N., Reeve, A.J., Chessell, I.P., and Rassendren, F. (2008). Up-regulation of P2X4 receptors in spinal microglia after peripheral nerve injury mediates BDNF release and neuropathic pain. J Neurosci. 28, 11263-11268.
van Gorp, S., Kessels, A.G., Joosten, E.A., van Kleef, M., and Patijn, J. (2015). Pain prevalence and its determinants after spinal cord injury: a systematic review. Eur J Pain. 19, 5-14. Wang, L., Zhang, Y., Wang, Z., Gong, N., Kweon, T.D., Vo, B., Wang, C., Zhang, X., Chung, J.Y., and Alachkar, A. (2016). The antinociceptive properties of the corydalis yanhusuo extract. PLoS ONE. 11, e0162875. Yuan, C.S., Mehendale, S.R., Wang, C.Z., Aung, H.H., Jiang, T., Guan, X., and Shoyama, Y. (2004). Effects of Corydalis yanhusuo and Angelicae dahuricae on cold pressor-induced pain in humans: a controlled trial. J Clin Pharmacol. 44, 1323-1327. Yan, J., Fu, Z., Zhang, L., and Li, C. (2018). Orai1 is involved in leptin-sensitive cell maturation in mouse dendritic cells. Biochem Biophys Res Commun. 503, 1747-1753. Zhang, M.Y., Liu, Y.P., Zhang, L.Y., Yue, D.M., Qi, D.Y., Liu, G.J., and Liu, S. (2015). Levo-tetrahydropalmatine attenuates bone cancer pain by inhibiting microglial cells activation. Mediators Inflamm. 2015, 752512-752519. Zhang, Y., Wang, C., Wang, L., Parks, G.S., Zhang, X., Guo, Z., Ke, Y., Li, K-W, Kim, M.K., and Vo, B. (2014). A novel analgesic isolated from a traditional Chinese medicine. Curr Biol. 24, 117-123. Zhou, H.H., Wu, D.L., Gao, L.Y., Fang, Y., and Ge, W-H (2016). L-Tetrahydropalmatine alleviates mechanical hyperalgesia in models of chronic inflammatory and neuropathic pain in mice. Neuroreport. 27, 476-480. Smith, R.G., Alexianu, M.E., Crawford, G., Nyormoi, O., Stefani, E., and Appel, S.H. (1994). Cytotoxicity of immunoglobulins from amyotrophic lateral sclerosis patients on a hybrid motoneuron cell line. Proc Natl Acad Sci USA. 91, 3393-3397. Beattie, M.S., Hermann, G.E., Rogers, R.C., and Bresnahan, J.C. (2002). Cell death in models of spinal cord injury. Prog Brain Res. 137, 37-47. Pelissier, T., Laurido, C., Hernandez, A., Constandil, L., and Eschalier, A. (2006). Biphasic effect of apomorphine on rat nociception and effect of dopamine D2 receptor antagonists. Eur J Pharmacol. 546, 40-47. De Rivero Vaccari, J.P., Bastien, D., Yurcisin, G., Pineau, I., Dietrich, W.D., De Koninck, Y., Keane, R.W., and Lacroix, S. (2012). P2X4 receptors influence inflammasome activation after spinal cord injury. J Neurosci. 32, 3058-3066. Sakaki, H., Fujiwaki, T., Tsukimoto, M., Kawano, A., Harada, H., and Kojima, S. (2013). P2X4 receptor regulates P2X7 receptor-dependent IL-1β and IL-18 release in mouse bone marrow-derived dendritic cells. Biochem Biophys Res Commun. 432, 406-411. Lukovic, D., Moreno-Manzano, V., Lopez-Mocholi, E., Rodriguez-Jiménez, F.J., Jendelova, P., Sykova, E., Oria, M., Stojkovic, M., and Erceg, S. (2015). Complete rat spinal cord transection as a faithful model of spinal cord injury for translational cell transplantation. Sci Rep. 5, 9640. Zhang, D., Xuan, J., Zheng, B.B., Zhou, Y.L., Lin, Y., Wu, Y.S., Zhou, Y.F., Huang, Y.X., Wang, Q., and Shen, L.Y. (2017). Metformin improves functional recovery after spinal cord injury via autophagy flux stimulation. Mol Neurobiol. 54, 1-15. Sharif-Alhoseini, M., Khormali, M., Rezaei, M., Safdarian, M., Hajighadery, A., Khalatbari, M.M., Safdarian, M., Meknatkhah, S., Rezvan, M., and Chalangari, M. (2017). Animal models of spinal cord injury: a systematic review. Spinal Cord. 55, 714-721.